TALLAHASSEE, Fla., April 16, 2019 /PRNewswire/ -- Importation undermines our core efforts to keep our medicine supply safe. State and federal authorities regulate every entity in the U.S. supply chain from the point of manufacture until a medicine is dispensed, and that makes counterfeits in the legitimate supply chain rare. In 2013, Congress passed the Drug Supply Chain Security Act to make the supply chain even stronger, and the U.S. began a ten-year project to implement it. This system (also referred to as "track and trace" and "e-pedigree") only works as well as the entities participating in it fear regulatory enforcement. The Florida legislature is considering harmful proposals that would open up the state's drug supply to dangerous counterfeit drugs. Take action today by calling (850) 659-3960. 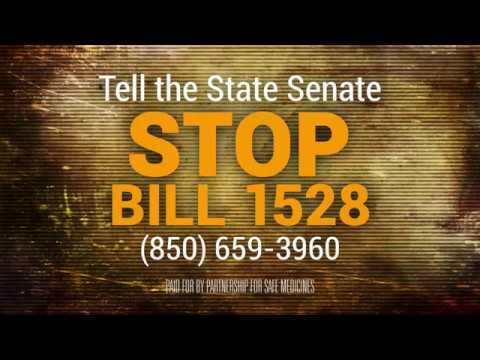 The Partnership for Safe Medicines (PSM) has been steadfast in its effort to oppose importation proposals when they endanger public health, and has launched an extensive advertising campaign in Florida to address the importation proposals currently under review by Florida policymakers. The campaign will include a broadcast and cable television campaign in key markets including Miami, Ft. Lauderdale, Tampa, Orlando, Jacksonville, Ft. Myers, and Tallahassee, as well as print and digital ads in the state. "Importation proposals sold under false pretenses constitute a public health threat," said Shabbir Safdar, Executive Director for the Partnership for Safe Medicines. "Every Florida legislator that glosses over the dangers of counterfeit medicines in talking about these bills increases the chance that someone will break the supply chain and introduce a counterfeit into Florida even before the law is implemented." Criminals make billions of dollars creating and selling counterfeit drugs around the world, and those products make their way into the United States. They duplicate the exact packaging, look and taste of the real thing. They can be difficult to detect, but detecting them is important. Counterfeit drugs can be a death sentence for the patients who end up taking them. Fake drugs deny patients treatment that can alleviate suffering and save lives, promote drug resistant strains of disease and may cause dangerous or deadly reactions to undeclared drug ingredients. "Nineteen years ago I received a counterfeit medication as part of my HIV treatment sourced by my pharmacy from a Florida pharmaceutical distributor", said Rick Roberts, PSM Board member and counterfeit victim advocate. "This same counterfeit made it to a total of seven other states. This was a dark day for Florida's leadership, but many positive efforts were made to secure the supply chain after that. If Florida passes importation, I'm afraid it will return to the days of being the source of counterfeit medicines in America." You can learn more about Rick Roberts' story on PSM's YouTube channel. Comprised of 69 non-profit organizations, (PSM) is a public health group committed to the safety of prescription drugs and protecting consumers against counterfeit, substandard or otherwise unsafe medicines. PSM follows a set of principles to support quality assurance programs and establish a drug distribution system that is without compromise. PSM members are dedicated to protecting the safety of American consumers by curbing the manufacturing and sale of dangerous counterfeit drugs. Our goal is for all consumers to be aware that counterfeit medicines do exist, they are not safe and together we can take action to avoid them. PSM works with patient advocacy groups and consumer groups to raise awareness of counterfeit drugs within the United States and to teach patients and medical professionals how to buy medication safely and affordably without risking their lives by dealing with unlicensed, dangerous counterfeit medication sellers.